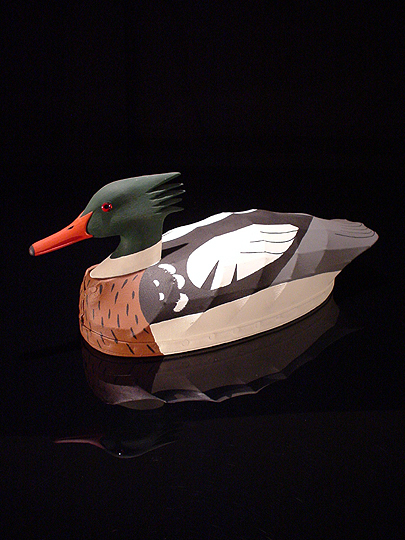 The decoy is made using a solid-wood base, neck, and head. The body is made using a framework of steel wire over which canvas is stretched and riveted to the base. The decoy is then painted and waterproofed. This decoy was made by Nick Sapone, of Wanchese, North Carolina. (Wanchese is a small fishing town at the southern end of Roanoke Island, just a few miles from Manteo.) Nick is The Man when it comes to decoys... he has won multiple awards for his decoys and has been featured in several magazines. Although Nick's decoys are fully functional, they also look great just sitting on a shelf. My dad introduced me to the idea of decoys as art, and it seems to be catching on. Click here for information about how to purchase a decoy from Nick.